Being a graphic designer sites like Behance, Dribble and even Pinterest are a happy place for me. I spend hours and hours on this heaven and get a lot of inspiration and new ideas as well as learn new things about the industry. Behance is the carrier and breeder of Latest Design trends. People from around the globe share their creative work here and add diversity to this amazing community. 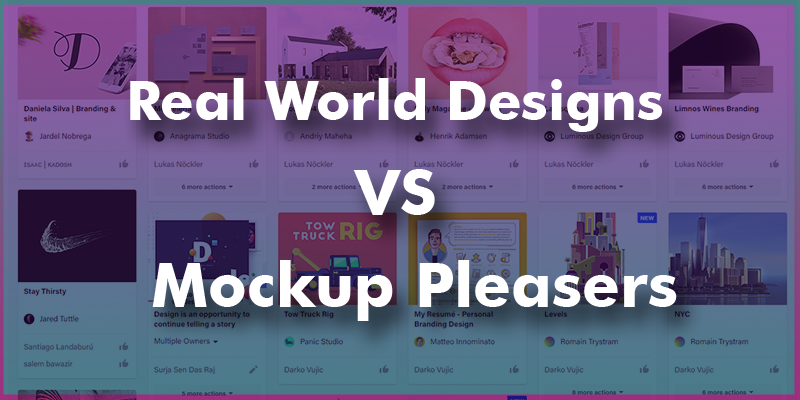 One thing I noted recently that most of the work people are sharing on these sites is not even Practical design projects or real world usable designs. Most of the designers are sharing their ideas about redesigns, their own take on different logo designs and websites. Yet there is a lack of real design projects that represent real world businesses or brands. That made me think that we are heading towards a new type of design trend, that is Mockup Pleaser Designs. Don’t get me wrong, that is some top notch work, but it doesn’t exist in the real world for many reasons. 1 – Concept Design That is not Usable in Real World. Like Concept cars, The Concept Art is also not usable in the real world projects, it is either too wild or has very less representation of a brand at the current stage. A logo design that has gazillion colors may look stunning but it will not be used by a Brand who has to print it on thousands of places. Logo and Branding designs are very carefully designed keeping the Scalable factors in mind. A logo design should be easily printable, scalable and should not lose its core integrity when printed in mono color or in black and white. Almost all the concept art design you see in the wild has no personal connection or relationship with any brand because it is just an imagination of artists own mind and what he/she was feeling at that time. 4- Designed just because designer Can! Most of the Concept art work is done by either designer who is in design schools, learning new things or people just doodling in leisure time. It shows that they can design weird things. This is a great thing that people keep experimenting, keep making new things and keep improving their skill set. There is a downside of this trend as well. People keep experimenting with their ideas and keep sharing them without explaining them at all. For example, you will see this huge collection of Animal logo designs, that looks stunning but no information about where and for whom they were designed or why these were designed in such manner in the first place. What these designs actually show? 3- May misguided people about design capabilities and trends. 4- Lack of distinction between Real and hobbyist designers. Whenever a company needs a Logo and Branding design or decide to have a new website design or redesign their existing website, generally they will search for Logo and Branding Designers or Website designers on Google and most probably will land one of these design sharing websites. They will see amazingly bright logos and website designs flying around left and right. Their mind will be tricked into hypothetical design sense in which they will start to envision their own Logo or website design. Without even knowing that these designs not even practical nor will do their brand any good at all they will make up their mind and most probably end up misguided completely. This little diversion causes a lot of issues later on when a Designer they eventually hire will present them designs that are practical, suit their brand and compliments their business. That client will feel that standard or quality of work is not up to the mark and does not translate their vision at all. That will leave both parties in a state of limbo as both of them have different realities and none of them knew which one other party has conceived real for them. A bit of a Christopher Nolan’s “Inception” Right? How to Choose Best Designer for Logo and Branding Project? It is absolutely necessary that you hire a right Person to design Logo and Branding for your business, But How you will find the best Graphic Designer? It is not that difficult, When you land on some design that you really like, contact the designer and tell them your story and ask them what they think about your project. If the Designer addresses the right points which I explained above he is your Guy.The designer should take every project with full passion and attention. The designer should take every project with full passion and attention. If a designer takes a project and treats like any other project the quality of design will not be that great, Designer who connects with the business ask lots of insightful questions and present suggestions will stand out from the hobbyist and newbie designers. Designers have a great Responsibility to not only Educate the people around but also Educate their clients as well, Rember you are the ones who have more knowledge and experience about the design, We are the people who know what works and what don’t. Don’t shy out calling spade a spade. If a Client wants to go in some wrong direction due to the misguided inspiration they had, it is our Job to Guide them and explain to them that it is not going to be a great idea following Concept art.